If you sell anything that is made with fabric, there is a good chance the product is covered by the labeling requirements of the Federal Trade Commission (FTC). Examples of products that fall under these regulations are apparel, home textiles, umbrellas, flags, cushions, furniture covers and more. The brand owner or importer of record is held responsible in making sure labeling is done correctly, because should there be a problem, there is a risk the product could be held at the border for non-compliance or, if it’s something your retailer starts policing, you risk having your product suspended until the labeling issue is corrected. Amazon, for example, appears to be rolling out textile rules using their Restricted Products program, so this could potentially be a big issue for some sellers. It’s important to understand that domestic political protectionist policies play a large role in today’s labeling rules, because that goes a long way toward explaining why some of the rules don’t make sense. They’re meant to be a little bit difficult to comply with to protect domestic industry players – and this is true of the labeling regulations in many countries. It’s important to also understand that the requirements for the U.S. are usually different than for other regions, like the EU. Want to make sure your supplier complies? 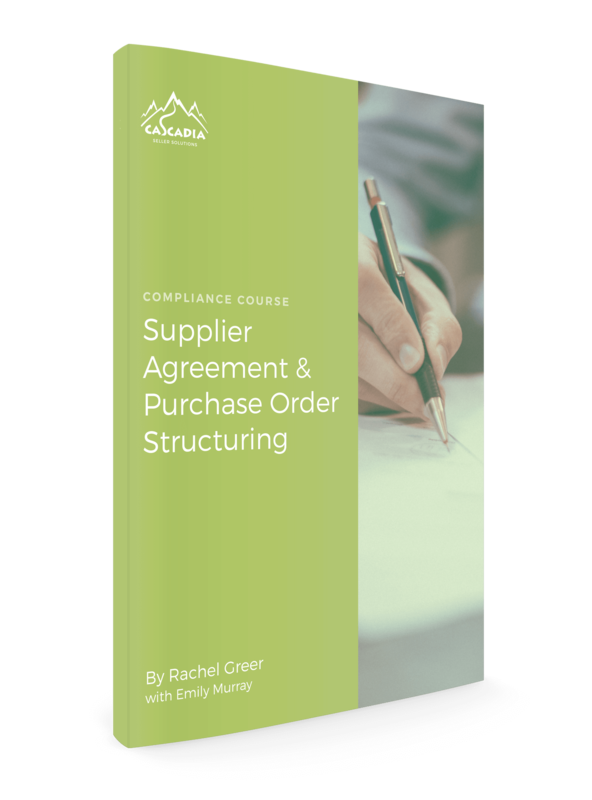 Download our handy Supplier Agreement and Purchase Order Guide to learn how to communicate compliance requirements to your supplier. The 8 key features of a Supplier Agreement with a format you can implement immediately with your suppliers, to protect yourself not only during the production of the goods, but after if Amazon asks you for information about them. 3 videos to learn about business in China so you're prepared for the cultural and business differences you'll encounter. The only information you need to create the perfect purchase order that clearly defines who pays what and when and what you're getting for your money. Fiber disclosure: You must disclose the GENERIC name of the fiber used in your product. “Microfiber” is not the generic name of a fiber; it’s a word used to describe the thickness of a fiber. But is that fiber polyester? Nylon? Other? That’s what you must disclose. And “Lycra” isn’t a fiber either; it’s the brand name of a spandex fiber. Some fibers are illegal to claim, like Bamboo, which the FTC regards as a highly processed rayon fiber. So if you want to use the word “Bamboo” in describing a fabric, you must say “Rayon made from Bamboo” or similar clarification. The FTC publishes lists of generic fiber names they recognize and the “correct” spelling for the U.S. market, which is sometimes a different spelling than for the rest of the world. Washing (Specify by hand or by machine, type of cycle and water temperature). And if you list “do not dry clean”, you should have a test report available that shows your product is harmed by dry cleaning. Drying (Specify machine, dry flat or hang to dry). Americans default to using their dryers, so you should know in advance if your product is harmed by a dryer through pilling or shedding OR experiences excessive shrinkage. In lieu of instructions by word, you can use care symbols, but keep in mind the U.S. symbols are not well harmonized with the rest of the world, so make sure your symbols are correct for the marketplace where you sell. Additionally, if you use GINETEX symbols, which are widely recognized, you must get licensed to do so. Identity of manufacturer or importer: The easiest thing to do is apply for a Registration Identification Number (RN) with the FTC (it’s free! ), so all you have to do is put a 6 digit number code on your label. If you choose not to do that, you must list the company name under which you do business- not a brand or designer name. The objective here is traceability, so at any time, the FTC could know how to find you in cases of mis-labeling. Here are links to FTC websites that spell out all the many details about their fiber disclosure and care labeling laws. At Cascadia, we’re experts in navigating the ins and outs of textile industry labeling requirements. We can help you create labels, (re)write detail page claims, register with the FTC or develop a plan of action if you run afoul of the Restricted Products program. What are the most common issues we see with textile labeling for Amazon sellers? By far the top issue is warnings for Bamboo mislabeling. I wrote about this a few years ago – it’s an issue Amazon has long struggled with, including a not so auspicious settlement with FTC after getting sued by them for mislabeling items as 100% that they themselves sold, including private label products. The challenge here is the regulatory aspect is being enforced by a team internally called “Restricted Products” at Amazon. They do not function like the usual “Seller Performance” team. They are overseen by the legal department, and as you might expect can be therefore very challenging to work with. On average, we see 1-3 months turnaround time from them, although it’s possible to get lucky and get through this faster. Further, reinstatement doesn’t happen the same way for RP removals as it does for typical seller performance removals. If the product is found to have been delisted incorrectly, it’s removed from the banned list, and it’s as if the restriction never occurred. If, however, the restriction is found to be correct, you’re likely never going to get that ASIN back. We have had multiple clients experience the total and complete loss of their listing. All of their reviews, all of their sales history, rank, everything – because they mislabeled their fiber contents. Don’t let this happen to you! If you private label textiles, we can create a custom purchase order for you with all required textile labeling, a review of your packaging, and a product testing protocol to make sure your product is high quality. We even include a textile inspection checklist for free! Contact us for a quotation today to review your catalog and protect your investment!